Big Mountain's new 15 part hour long series 'My Family Secrets Revealed' premiers on Channel 4 Monday December 3rd. It's an innovative series that offers the British public a chance to connect directly with their family history for the first time. It will run for the next three weeks on the channel every day at 1pm. The series is the culmination of a lot of hard work by the Big Mountain team. In recent years the Newry/Dundalk based operation has been building IP, accessing new markets and creating real value in the company. 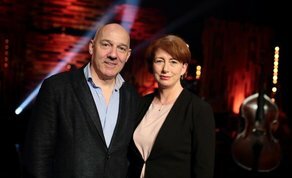 It's broken the UK and USA with new TV shows and currently has four series in production with three broadcasters in Ireland and UK with 20 people working full time. My Family Secrets Revealed - is an updated version of the company's format Genealogy Roadshow, first made for National broadcaster RTÉ and then for three seasons on PBS coast to coast in the USA. Big Mountain has democratised genealogy on TV – no celebrities, just regular people looking for the extraordinary in their own lives, everyone deserves their place in history. Based on the social trend of History being the new selfie – the format taps into a zeitgeist where people want to view themselves through famous connections- Elton John, George Clooney, Kate Middleton and historical figures like Bonnie Prince Charlie. The scale of the series is a culmination of commercial relationships built over time with partners such as Ancestry, allowing the production to be supersized and accessing audiences beyond TV through creation of digital content. Next is the roll out of the show internationally. The company has built a team in Northern Ireland/ROI to deliver a huge show, with support from Northern Ireland Screen, with 70 personnel across production with a 100 contributors.